BUSRide spoke with experts from across the transportation industry to hear their thoughts accessibility, the Americans With Disabilities Act (ADA), and what it means to go above and beyond in providing equal access for all passengers. What does “equal access” mean to your company? Ami Sailor: Each passenger experiencing transportation services in the same manner as the next passenger defines equal access for ARBOC. All riders should be able to enter the bus by the same method and with the same efficiency. They should be able to utilize all the features of the bus, improving the rider experience for everyone. Passengers with disabilities should travel less conspicuously as members of the mainstream, with their dignity intact. Pat Girardin: Equal access for Q’Straint goes beyond simply entering or approaching a particular space. We believe equal access extends to the overall well-being and safety of wheelchair passengers, who should be afforded the same level of security as everyone else. John Walsh: Whether a passenger is in a wheelchair or they have a walker or they are fully mobile, everyone is just another passenger boarding the bus; they don’t have separate experiences when they get on the bus. That means not having to board the bus via a wheelchair lift that takes four minutes, and possibly upsetting the rest of the passengers. It’s enabling our clients and users to be mobile. It allows them to make their doctor appointment, buy groceries, and live a normal life as an ambulatory person does. This is a huge issue, because a lot of the people would be home bound without mobility options. Steve Berry: To DDS’s business and the industry we serve, equal access means providing reasonable accommodation for all people to access services that are generally available to the public. My company wants to enable great rider experiences through our fleet management software and AVL terminals. This includes meeting the needs of all people, typical and disabled, from all economic levels, ages, races, genders, affiliations and so on. It’s not enough to simply provide services that people can use. These services should be extended even to people in rural and lower economic areas. What do you believe has been the most significant advance in accessibility of the last five years? The last decade? Sailor: The first low-floor cutaway revolutionized the transportation industry in 2008, nearly a decade ago. Before ARBOC’s Spirit of Mobility, anyone who needed extra assistance entering the bus was forced to be lifted into the rear of the vehicle on a platform which takes more time, draws unwanted attention, and can be an intimidating experience for some. With the ramp, all passengers enter through the same door with minimal-to-no assistance, which was unheard of for any cutaway at the time. While the Spirit of Mobility changed the lives of both riders and drivers, it was not in the budget for many transit agencies. Fast forward to 2013, ARBOC released the first non-kneeling cutaway to meet ADA requirements. Because it does not include the kneeling feature, the Spirit of Freedom is an affordable alternative for someone seeking an accessible cutaway that meets ADA requirements. Girardin: When it comes to products, the most significant advances are in the rate of new product adoption. 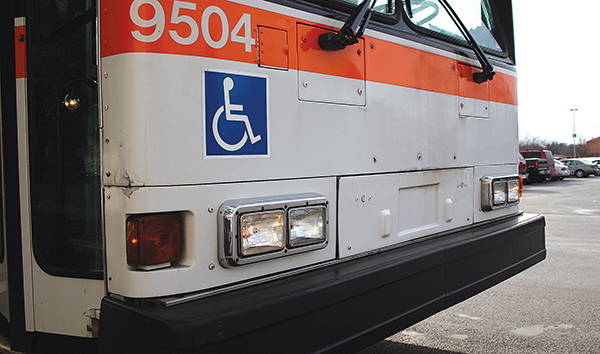 Transit properties have incorporated the latest solutions in an effort to not only keep wheelchair passengers as safe as possible, but also to improve efficiencies within their own businesses. We’re excited that products like the Q’POD are now industry standard, and that our new Quantum, the first independent wheelchair securement, is also gaining recognition. From a business perspective, this kind of product adoption is always encouraging, but even beyond business development, we’re proud to be part of a bigger initiative that is providing improved accessibility to the mobility community. Products aside, perhaps the most significant advance in the last 10 years is the perception of wheelchair passenger transportation. A decade ago, the focus was on basic compliance and meeting minimum requirements of law. Today, we see a much more compassionate approach that considers what is truly best for the mobility community, and we like to think we’ve played a part in that transformation. Walsh: A big advance was when heavy-duty transit went from high-floor to low-floor, which is now commonplace in agencies. Now they don’t buy anything BUT low-floor heavy-duty vehicles for their fixed routes. This has to do with making the vehicles more accessible, and the most drastic way to do that is by lowering the floor of the bus. It has truly been a game changer in the industry. In general, there are also safer products that are now be offered in the market, such as weight capacities on the lifts and better restraints, to meet new regulations that have been pushed by the ADA. Berry: One great advancement is in interactive voice recognition which has afforded a great benefit to the transportation industry. Most are familiar with Apple’s Siri, Google’s Google Now, Microsoft’s Cortana and Amazon’s Alexa. These voice recognition systems provide accessibility and capabilities that we really haven’t seen before. Some might challenge that by correctly stating that this technology has been available to consumers for decades. But not until recently has the reliability and application of voice recognition advanced sufficiently to impact society in the way it has today. Look for voice recognition to be used more heavily and applied in increasingly new and innovative ways as the technology improves. In what ways does your company go above and beyond the requirements of ADA when designing your product? Sailor: ARBOC strives to not only comply with ADA, but to embrace it. In every product plan, we incorporate ADA-exceeding designs in every possible area. Most know the ADA requirement for the ramp slope is 1:4. Although this is certainly preferred to using a lift, it is still quite challenging for those in wheelchairs. ARBOC offers products with 1:5 and 1:6 slopes, making it easier for all persons involved. All ARBOC buses have wide entryways and spacious cabins to ensure easy maneuverability for both ambulatory and wheelchair passengers. We incorporate even the smallest of details, such as contrasting colors for the visually impaired and easy-to-reach stop request buttons for riders in wheelchairs. • We always test our products beyond baseline. • We recognize that even the best products can still be used ineffectively, which is why we invest in so many training initiatives, including our national training seminar, onsite training programs as well as new online programs. • We have partnered with well-known university programs in addition to developing our dedicated iQ crash test facility. Together, these initiatives provide yet another opportunity for us to learn about wheelchair passenger safety and develop innovative solutions to continually improve it. • With the latest release of the Quantum product, we’ve not only met the letter of the ADA law, but we have brought a product to market that truly extends to the spirit of that law. Walsh: We’ve designed wider, 102-inch wide vehicles to accommodate better access. We’ve also designed larger wheelchair positions instead of the standard 30-by-48 inches. We’ve gone to extensions of the full-length L-track from front to back to accommodate different-sized wheelchairs and scooters for the wheelchair-aided passengers. In mobility vans, we’re doing wider doors. There’s a huge focus on the community itself and the devices that they use. Berry: Our ADEPT demand response software platform is designed specifically with ADA riders in mind. Our software captures information about the individual needs of each rider in order to select the appropriate service for that rider automatically. For example, in the case of someone who uses a wheelchair, the ADEPT system knows that the rider is in a wheelchair (based on their profile), whether the person requires an attendant to travel with them, or any other special needs. If the person is sight-impaired and needs a service animal to travel with them, that information is also included in their profile. Our software is fundamentally an intelligent scheduling and dispatch system for on-demand transport for people with special needs. When the system schedules a trip for an individual rider, it automatically uses all of that information to put them on the right vehicle at the right time. What are you doing to ensure better passenger accessibility in the future? Sailor: We are currently in the design stages for several new products, one of which is the Spirit of Equess (SOE). The SOE is a low-floor rural transit bus on a purpose-built ARBOC chassis. We are incorporating a fully flat floor that seats 25 and a ramp with an ADA-exceeding 1:6 slope. ARBOC collaborated with major worldwide companies such as Cummins, Allison, ZF, I/O Controls, and Grayson Thermal Systems to integrate state-of-the-art technology that allows for easy accessibility. In addition to creating a design accessible for passengers, we designed the Spirit of Equess to have accessible components for service technicians, which is an element that is often overlooked. All major components are designed to be accessed from the exterior leading to quick, easy serviceability. Girardin: One great example is with our Q’POD product. Varying bus types, layouts, and equipment made it difficult to install, maintain and use a standard tie-down safely and effectively on buses. Drivers did not know what to expect, and in many cases would not use the equipment, which clearly was to the detriment of wheelchair passengers. The introduction of our Q’POD product was the first time that a driver could approach wheelchair securement the same way every time, regardless of which bus they were assigned. But Q’POD did not stop there. Since its introduction to the market nearly 10 years ago, the product has constantly evolved to meet new challenges while keeping the same promise of improved accessibility and usability. Walsh: The low-floor school bus, low-floor cutaway, and the minivan with dual ramps. These are three products that are really changing the marketplace. We perform our product development based on customer feedback. What you get with REV Group is innovation. We’re looking to bring modern technology to the marketplace because that’s who we are at our core. We want to lead by example. Berry: Our next generation ADEPT platform is in development now. This exciting and innovative product can be hosted in the cloud, making deployment and maintenance of the software much easier and lower cost. It helps to improve accessibility of the system as well. The system is modular and can be accessed entirely through the web. We’re also developing better planning and scheduling tools within our software that will improve operational efficiency and ease of use. The end result will be lower cost services and higher rider satisfaction. Our first ADEPT platform was introduced 20 years ago. The broader vision that we have for ADEPT is mobility-as-a-service, or “MaaS”. The transportation space is evolving into a marketplace that will put all modes of ground transportation into a resource pool. Consumers will have the ability to arrange transport from their origin to their destination in a single operation and the software system or ecosystem will determine which modes and providers of service are best to achieve their travel goals. A single trip could include fixed route transit services, paratransit, taxi, a transportation network company (TNC) like Uber, and/or other mode of transportation. All of these service providers will be part of the MaaS marketplace. DDS will deliver technology that leverages the marketplace and gives riders greater options and greater capability to maintain their independence and lead fulfilling lives. What is triggering new product development? Sailor: Like other industries, new product development is driven by the customer. To ensure we are aware of our customers’ needs, we receive continual feedback from our dealers and end users. From this response, we can break down their wishes into four simple categories: cost, time, quality and safety. To guarantee everyone can afford an ARBOC, we have several different product lines at varying price points and are continually designing new products to give our clients further options. On a high-floor bus with a lift in the rear, a driver spends several minutes loading and unloading passengers. All ARBOC buses are equipped with a ramp that deploys in 10 seconds, which translates to tremendous time savings. We have a great quality assurance program to guarantee our customers receive the high quality that ARBOC is known for. And last is safety: ARBOC performs more safety testing than any other manufacturer in the market. Girardin: Wheelchair passengers do not always have a voice in transportation, and we hope to be a catalyst that helps them be heard. Safety standards are constantly improving, and we’re pushing to extend these standards to our mobility community. For us, that’s what drives product development. Walsh: REV is a company that is so on the edge of always looking for something new, safe and reliable. And we’re especially very gifted at listening to customer needs and really taking that from a drawing board and implementing a new product into the marketplace. We also pay attention to trends in the industry. It’s important that, across all of our divisions, we’re not looking at just one scope of the business. The focus is on the entire industry, whether it be demand-response or fixed route. We need to approach the entire industry with an eye toward reliability and safety. Berry: Mobility-as-a-service and cloud technology. Many public agencies are already looking at providing on-demand transportation services beyond what is currently offered for paratransit. The new on-demand services would be offered to riders who typically use traditional fixed route transit services but are looking for greater flexibility and convenience. In order to support relatively expensive on-demand services, the agencies are hoping to partner with TNCs, taxi companies and transport brokers to provide the majority of the on-demand rides. This is the beginning of a new transportation marketplace. Dispatch and scheduling software must evolve to support new transportation models and integrate with third-party systems. Sailor: With an aging population, the trend will be toward additional advancements that make public transportation increasingly accessible. Allowing our parents and grandparents to regain (or maintain) their independence and dignity should be a focus for everyone involved in transportation. We will also continue to see advancements in safety requirements, including additional surveillance and driver alerts, all of which will serve to make passengers feel safer while using public transportation. Girardin: We believe there can be a time when wheelchair passengers have the same level of access as everyone else. We think of this access not only in terms of overcoming obstacles like curbs and stairs, or the simple freedom to travel and reach a destination – though we can all agree those are important, to be sure – but most importantly, we envision a future where all wheelchair passengers are afforded access to the same level of safety during their travel as those around them. Walsh: I think the industry as a whole is going to become safer. Whether that’s structurally, whether that’s from technologies that are integrated in the vehicles, whether that’s from different ideas that are being generated industry-wide, safety is a big-ticket item that you are going to see more of over time. It will also be a transportation world where all vehicles are equal access, all the time. There are initiatives underway with REV Group that hope to pull the 20-year vision much closer to us. There’s a lot involved in that of course. Market acceptance, adoption, lots of engineering and design work that we’ll have to endeavor in. We’ve already started that with the Champion low floor, and with the Collins low-floor for school buses – as well as with ENC, 40-foot access low-floor buses and ElDorado mobility vans. We’re really broadening our views. I don’t want to say five years but, if I had my way in a perfect world, we would be able to make all our initiatives happen in that period. We want everybody entering and exiting their vehicles safely, whether they’re rolling on, have a walker or a cane, or some other mobility impairment. Each person has the same access, the same transportation experience as everyone else. We’re driving for that. Berry: The entire industry is reimagining how transportation will be delivered in the next decade and beyond. Smart cities, autonomous vehicles, transportation marketplaces, and other advancements are all contributing to greater accessibility of a wide range of services. Before long these advancements will be mainstream. Perhaps one of society’s greatest advancements is that broad, even universal, access to services that meaningfully enhance our lives is now a primary requirement in the planning stages. I don’t think that could have been said even 10 years ago. As we look ahead, we’re depending on the new technologies of today and the future to create opportunities for lifestyle enhancement – to make our lives better. What better future could we hope for ourselves and our children?